April 17, 2015 1:30 p.m. 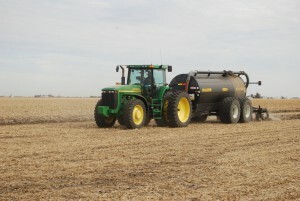 This manure and nutrient management in tile drained land webinar will expose participants to management and fate of manure and nutrients in tile drained agricultural landscapes. Participants will be given an introduction to tile drainage followed by information and case studies on the fate of manure application timing, rate and mobility to tile drains. Finally participants will learn about management practices and technologies aimed at helping producers reduce the risks associated with manure and nutrients reaching tile drains and associated surface waters. An application for continuing education credit for Certified Crop Advisors (CCAs) and members of the American Registry of Professional Animal Scientists (ARPAS) has been submitted. Dr. Jeff Strock is a Professor and Soil Scientist at the University of Minnesota Southwest Research and Outreach Center. Dr. Strock directs a field-based research program aimed at developing integrated water and nutrient management solutions for crop and livestock producers that reduces off-site nutrient mobility and improves water and nutrient use efficiency and crop yield. Current research activities include: ag water management and conservation; cropping system impacts and interactions on soil and water; and nutrient management. Dr. Larry Brown is Associate Professor and Extension Agricultural Engineer at The Ohio State University. Dr. Brown conducts research and extension programming for contractors, farmers, agencies and agricultural consultants for modern applications of land drainage and agricultural water management. He coordinates and instructs an annual multi-day program to provide continuing education for land improvement contractors, soil and water conservation technicians, farmers, engineers, consultants and others interested in soil and water conservation systems. Dr. Peter Kleinman is Research Leader and Soil Scientist at the USDA-ARS-Pasture Systems and Watershed Management Research Unit. Dr. Kleinman explores the interactions between land management and landscape processes that control the transfer of nutrients from land to water. Current research activities include: assessment of landscape processes on seasonal transport of phosphorus from agricultural lands; the role of soil P in controlling phosphorus losses in overland and subsurface flow; and the role of phosphorus sources on phosphorus losses in runoff and leachate. Dr. James Hoorman is an Assistant Professor for the Ohio State University as well as an Extension Educator for Putnam County. Dr. Hoorman’s research efforts have concentrated on using grass, legume, and brassica cover crops to improve soil structure and tie up manure nutrients to prevent runoff. He has produced several fact sheets and power point presentations on “Soil Ecology and Nutrient Management” and “The Biology of Soil Compaction”. Dr. Tim Harrigan is an Associate Professor of Bio Systems and Agricultural Engineering at Michigan State University. His research and Extension programs focus on mitigating adverse farming systems impacts on the environment and creating sustainable agroecosystems. His research includes the development of an innovative process that combines low-disturbance tillage, the seeding of forage and cover crops, and manure land application in one sustainable operation.